Scientists are reporting peculiar behavior among this season’s humpback whales. 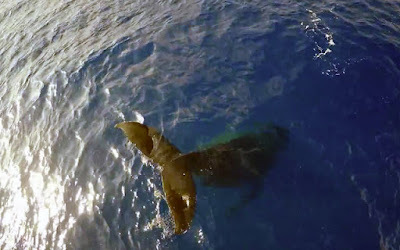 A recent video by NOAA's Hawaiian Islands Humpback Whale National Marine Sanctuary shows a female humpback standing upside down with her tail sticking out of the water, performing a sort of underwater headstand. Hawaii Public Radio. House Finance Chairwoman Sylvia Luke on Wednesday unveiled a proposed $13.7 billion budget for the coming year, but said she isn’t willing to commit just yet to some of Gov. David Ige’s most expensive spending initiatives. Star-Advertiser. The House Finance Committee took its first pass at the overall state budget bill Wednesday. It left largely intact Hawaii Gov. David Ige’s proposed $7.1 billion general fund spending plan for next fiscal year, which begins July 1. Civil Beat. Legislators are advancing a bill that effectively would shut out the public from the decision-making process in the awarding of temporary land permits by the state Department of Transportation. Star-Advertiser. Some political observers wondered how Donald Trump, a candidate who has insulted so many — women, minorities, veterans, the physically challenged, entire countries — and bragged so much could so easily prevail in an island state that is said to revere respect, tolerance and modesty. Civil Beat. Commentary: Lawmakers Return To The Bad Old Days Of Backroom Deals. A political fight over funding for the Department of Hawaiian Home Lands has unfairly ensnared the judicial system. Civil Beat. President Barack Obama has selected Hawaii’s High Technology Development Corp. along with 14 others to join the a national initiative to train the workforce for technology jobs. Pacific Business News. Commentary: What really happened at the ʻAha, part II. Whitewashed press releases, a sinister state bill and a flippant disregard for the rules of the Native Hawaiian convention. Hawaii Independent. The Honolulu Police Commission on Wednesday gave police Chief Louis Kealoha an above-average score for his job performance for last year, marking four consecutive years of high marks. Star-Advertiser. Federal investigation into police chief broadens. Hawaii News Now. The Honolulu Police Commission announced Wednesday the results of its annual performance evaluation of Chief Louis Kealoha. KHON2. City building officials this week gave a Makiki homeowner a second notice to clean up his Pensacola Street property — which is littered with three derelict vehicles, old furniture and trash — within 30 days or face additional fines. Star-Advertiser. A sailor killed in the attack on Pearl Harbor has been buried with full military honors nearly 75 years later. Associated Press. 75 years later, a Navy sailor killed in the attack on Pearl Harbor has gotten a proper burial. Petty Officer 1st Class Vernon Luke was laid to rest during a ceremony Wednesday at the National Memorial Cemetery of the Pacific. Hawaii Public Radio. With support from Gov. David Ige and the state Legislature, all systems are go for a $50 million upgrade to make Kona International Airport ready to welcome international commercial flights again. West Hawaii Today. A new trail the state plans to open later this year will offer hikers and other outdoor enthusiasts an up-close look at Hawaii’s dryland forests, home to the rare Hawaiian honeycreeper ­— the palila. Tribune-Herald. The state health department has released a new dengue fever risk map, and it appears Hawaii Island is on the verge of ending the mosquito-borne disease outbreak. Big Island Video News. No new cases of dengue fever were confirmed on Hawaii Island on Wednesday. The Kailua-Kona area, previously deemed the lone area on the island where people were at a high risk for infection, has been downgraded to a low-risk area. West Hawaii Today. Legislators now are looking to public-private partnerships — similar to those being pursued by Maui and East Hawaii — in the hope there might be a way to slow or stop the onslaught of invasive pests on Hawaii Island’s delicate ecosystems. Tribune-Herald. A 20-year agreement signed by Maui Mayor Alan Arakawa for a waste-to-energy facility is projected to cost Maui County taxpayers $35 million more than expected, an audit released Wednesday revealed. Star-Advertiser. County Defends Solid Waste Costs Following Release of Audit Report. Maui Now. As Kaiser Permanente Hawaii prepares to assume management of the state hospitals on Maui by July 1, the health care provider began distributing job packets and offers on Wednesday. Pacific Business News. Hawaii should dramatically improve its regulation of pesticide use and study its impacts — something the Legislature has repeatedly refused to do — according to a draft version of a report commissioned by the state and Kauai County. Civil Beat. Frustrated with what they called a lack of support from the state in addressing major transportation problems on Kauai, the county council on Wednesday lashed out at state officials for their “ineffectiveness” in handling crucial local road needs. Garden Island. Hawaiian Airlines is filling some of the void created when Island Air pulled out of the Lanai market. Star-Advertiser. Hawaiian Airlines’ interisland subsidiary, Ohana by Hawaiian, plans to add daily flights to Lanai in May, following an announcement by Island Air that it would cease flights to the Pineapple Island by the end of this month. Pacific Business News.